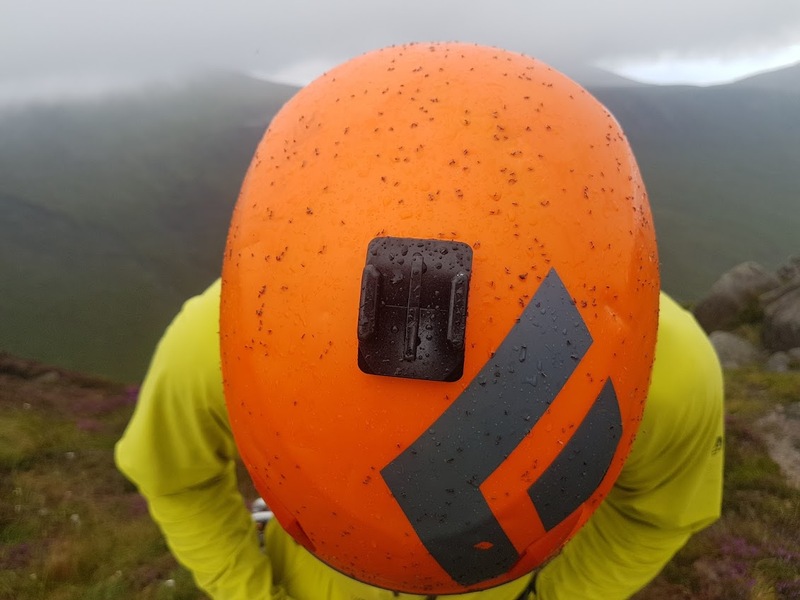 An ordinary climb rendered difficult by a dangerous combination of weather, injuries, darkness, lack of preparedness or other adverse factors. 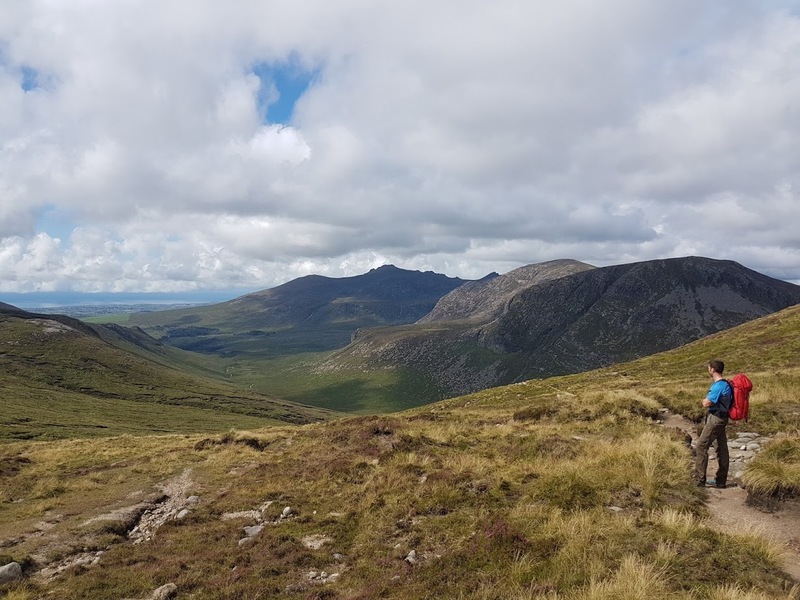 Went up North (Mournes, Slieve Beg) to do some more adventurous climbs. Had one for sure. 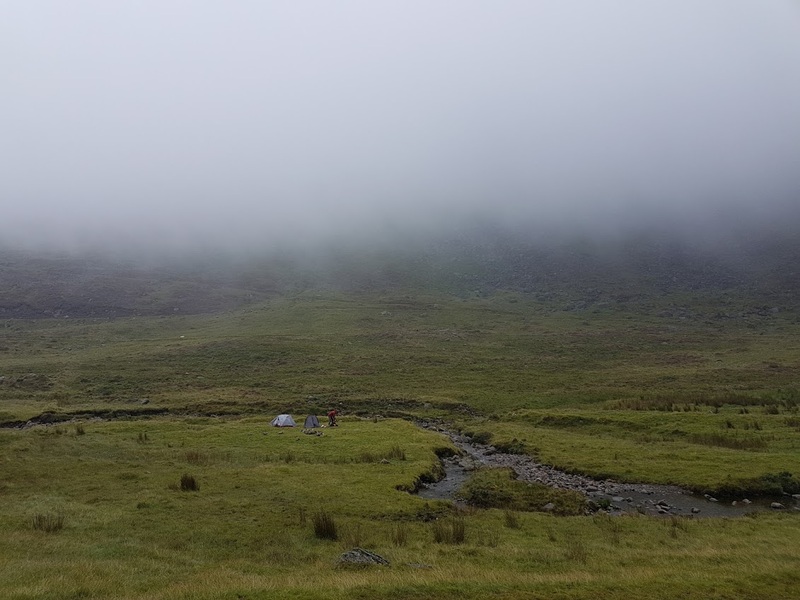 Not exactly an epic, but quite interesting combination of unfamiliar terrain, midges & rain. From the beginning though – Met up with Peter at Donard car park on Sat 9am. 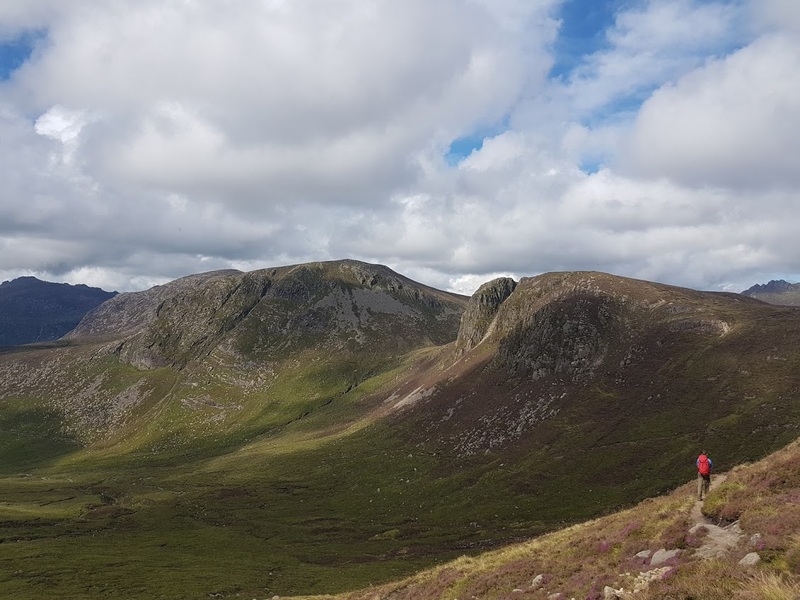 Decided to put up some effort and walk up all the way to Slieve Beg – by some described as best mountain crag in the Mournes. The walk taken just over 1.5h (all uphill, some 500m elevation gain) The views are indeed spectacular and worth the hard work. 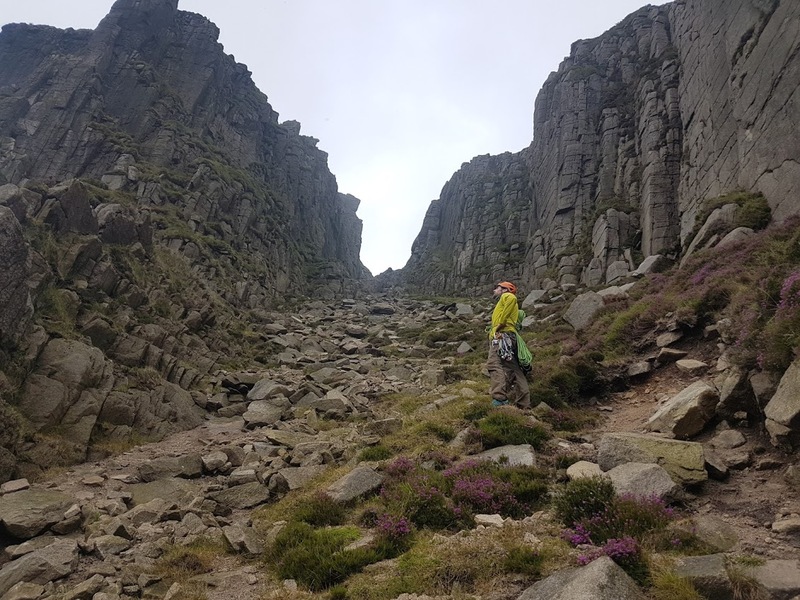 The most obvious feature is the huge central gully of the Devil’s Coach Road. To the left is the Main Face, south-east facing and characterised by a series of corners, and to the left again are two large south-facing areas separated by a steep grassy section, with on the far left a small buttress called Satan’s Buttress. 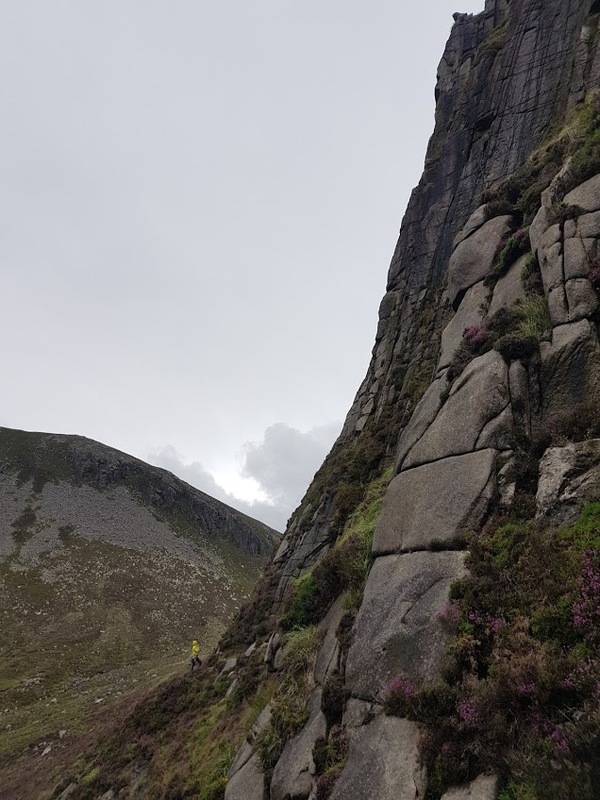 To the right of the Devil’s Coach Road are more broken crags the most obvious feature being a steep broad slab of rock taken by Mourne Maggie. J. McGuinness, J. Bruce. 19/5/73. 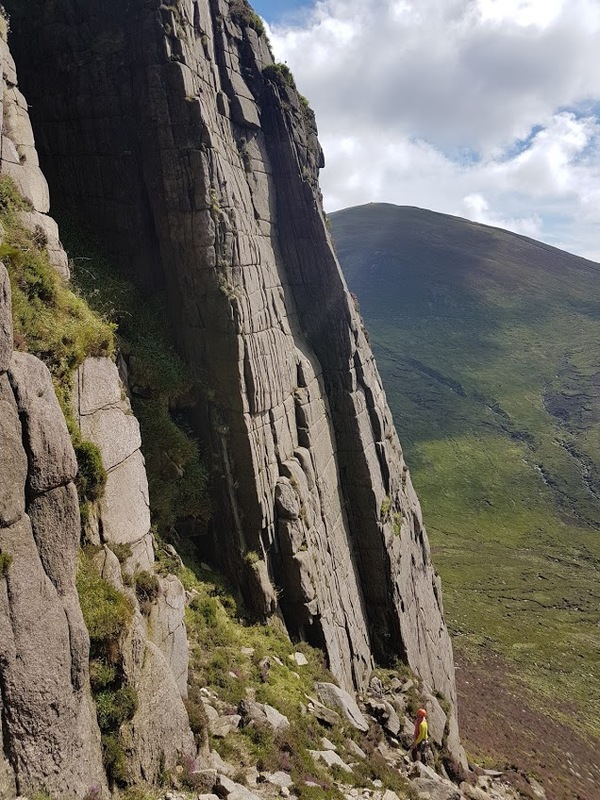 An excellent classic one of the best in the Mournes but there is a risk the rock could have a veneer of lichen due to lack of ascents. Start at the steep diedre at the bottom of the Devil’s Coach Road. Climb the diedre until forced to step right at a bulge onto the arete at 25m and follow this more easily to the top. 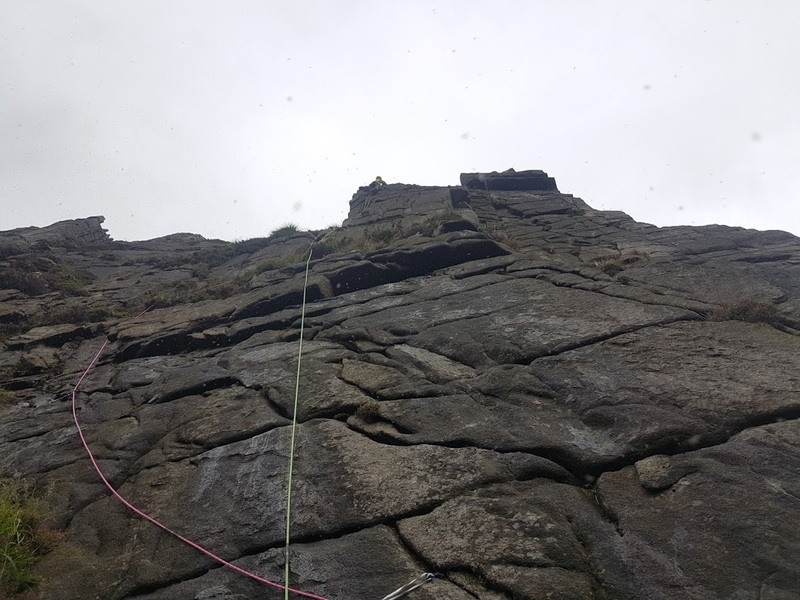 Getting to Sweetie Mice, HVS 5a *** – the route is the obvious corner. Unfortunately very overgrown these days. Now, the 3* rating might have been accurate few years ago when the route was clean – for us it was a rather severe case of extreme gardening. Peter lead it, I followed and pulled a ton of green stuff in the process. Perhaps next party of climbers will enjoy it more. It wasn’t a bad route. Just not really in 3* condition. C. Torrans, S. Billane, W. J. Baxter. 8/9/74. 1) 45m Trend left and follow crack to reach the diedre proper. Continue straight up corner (dirty exit) or (cleaner) up until it is possible to move out left on a big flake to the outside face and trend back right. On up ledges to good belay on the highest one. 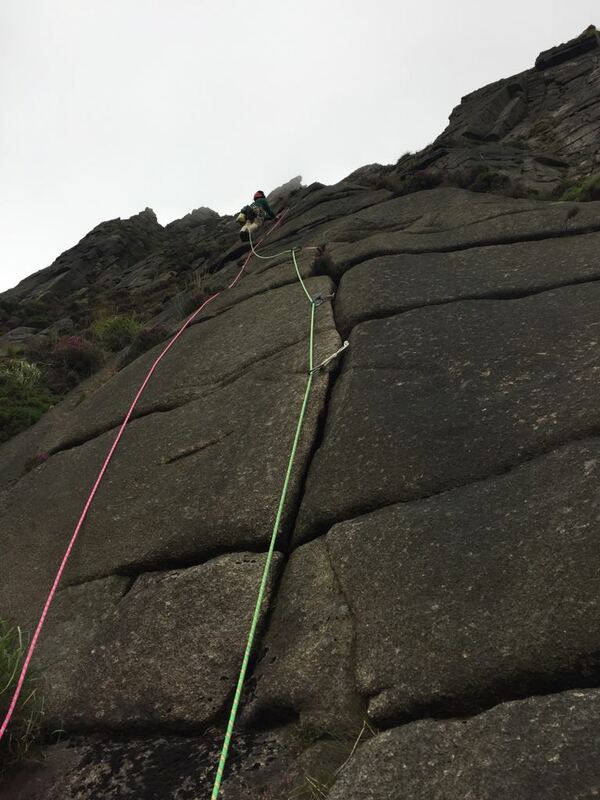 2) 40m Up corner to cracks on right and up cracks and easy ground to an arete on the right. Finish airily up corner in the arete. 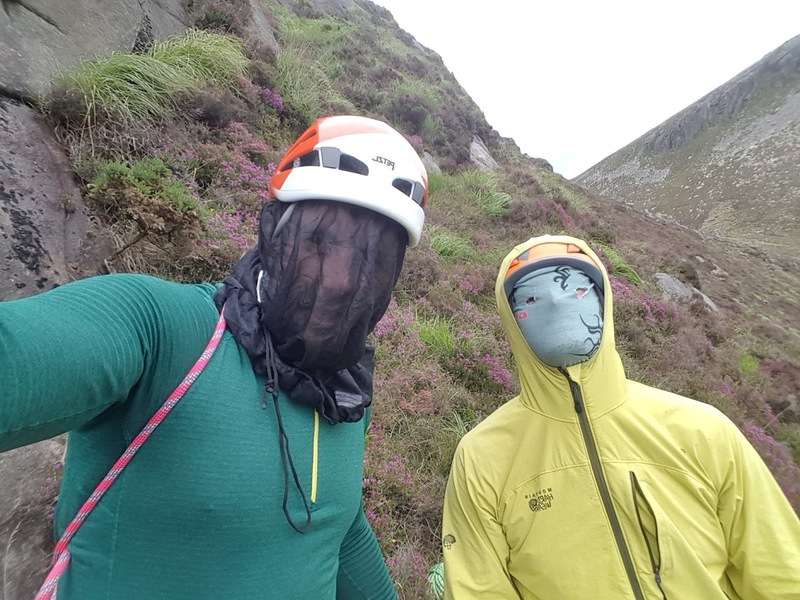 By the time we thought we were at the base of the climb the midges were already out. We figured we had the line so I just got on it. Me leading 1st pitch of ‘WTF am I’. It felt hard for the grade (supposedly VS 4c), but I kept going until a grassy ledge. From there it kind of didn’t match the description anymore, and I was only 25m up (p1 was meant to be 40m). I figured I’ll build a belay, bring Peter up and we’ll take it from there. And so we did. Unfortunately for us the single droplets turned into heavier rain, but that din’t scare away the insects. Double whammy. Anyway Peter went up another 20 odd meters, to a point where there was nowhere to go (at least not for our grade in those conditions). We were definitely off route. At this point we figured bailing makes most sense. We sacrificed 2 nuts, abseiled back to the base of the climb and scrambled around to the top. Bailing of the route – not my proudest moment. I studied the guide book later and I’m pretty sure we miss identified the start and instead of Wabash Cannonball VS we attempted Burden of Dreams (E3) – (and got shutdown on it’s 3rd, 6a pitch). I. Rea, P. Holmes. 23/4/90. Takes the left-hand, clean corner of the double diedre which gives a superb crux. Start at a left trending crack a few metres left of a grassy ramp which starts at the lowest point of rock. 1) 22m Go up crack which leads to a flake system trending left and follow this directly to belay on a ledge. 2) 12m Follow another left trending system of flakes to the left edge of overhang. Traverse horizontally under overhang until possible to cross it at break and then go straight up to ledge. 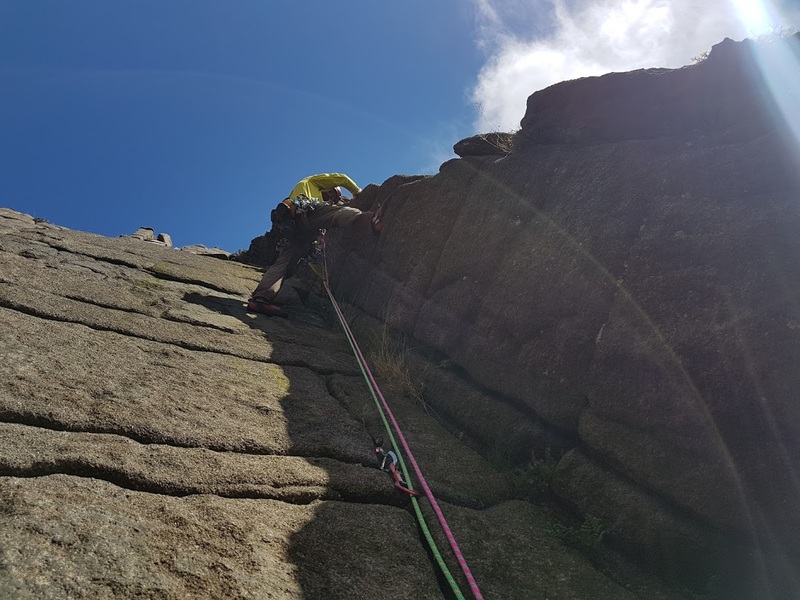 3) 40m Climb up to first roof and layback around this on the right and go up a bit until possible to step left into base of a very steep right facing diedre. Go up this and over roof (sustained) into niche as for The Fiddler and continue up to large ledge. 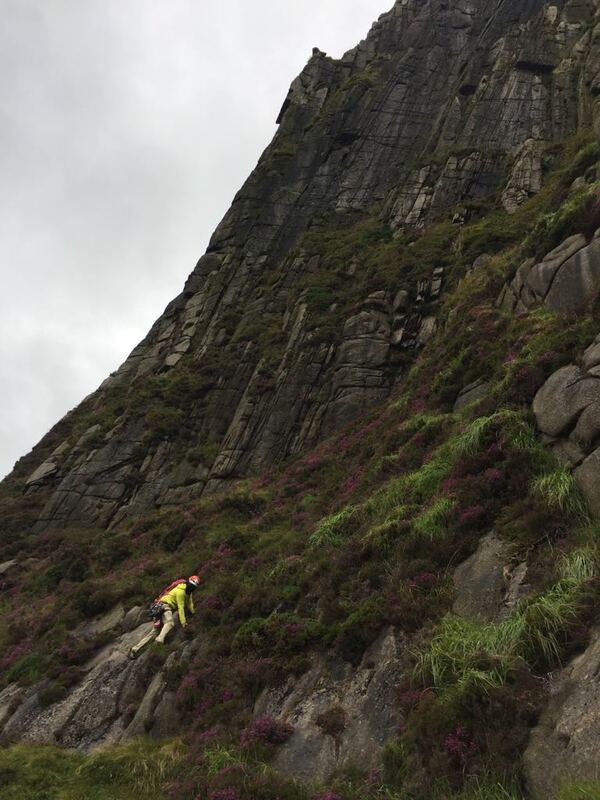 4) 40m Climb and scramble up the rock and heather as for The Fiddler. The midges were still full on out and the weather closed in totally, so we wanted to GTFO ASAP. 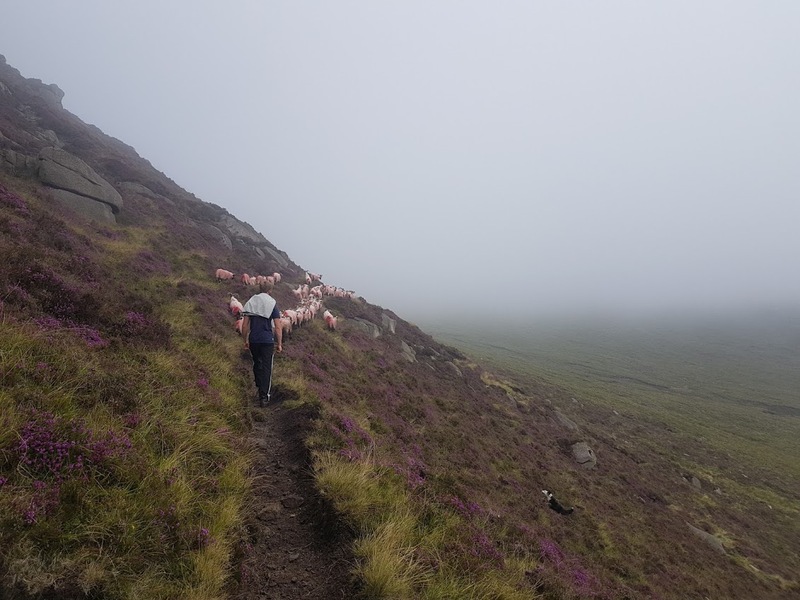 Luckily it was mostly downhill now, and for a while we had a good company – local farmer and his crew! 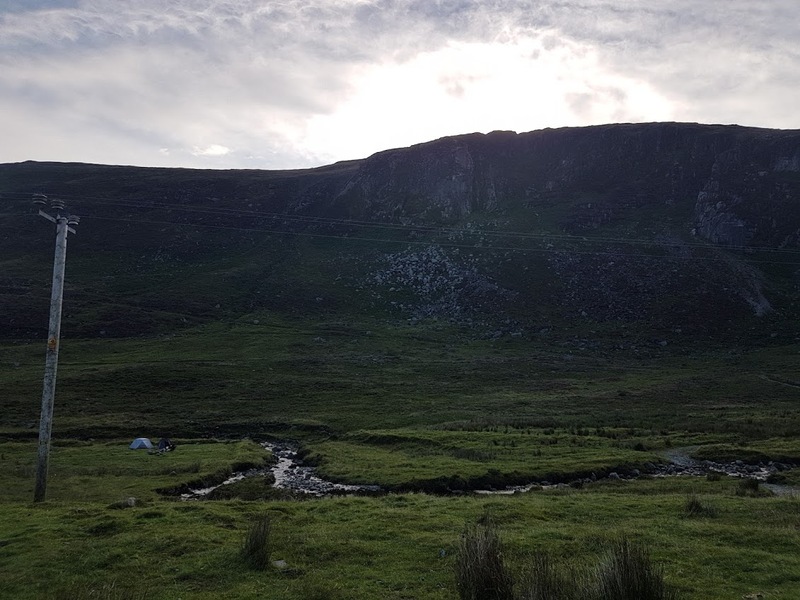 By 6.30pm we were by the Pigeon Rock – another crag, some 20mins drive from Slieve Beg, hoping to actually do some climbing the following day. It’s a place of great beauty and minimal walk-in. Something that appealed to us without a doubt after a lengthy day. Unfortunately the morning greeted us with rain, rain & more rain. This adventure was over. Totally worth it though. The outstanding beauty of the Mourn Mountains combined with fantastic routes available there make me thing I’ll be back many more times. For now though it’s time to start getting ready for next adventure – Picos de Europa in northern Spain! Departing Fri the 28th of July with Peter. 7 days of hopefully adventures of equally epic proportions.